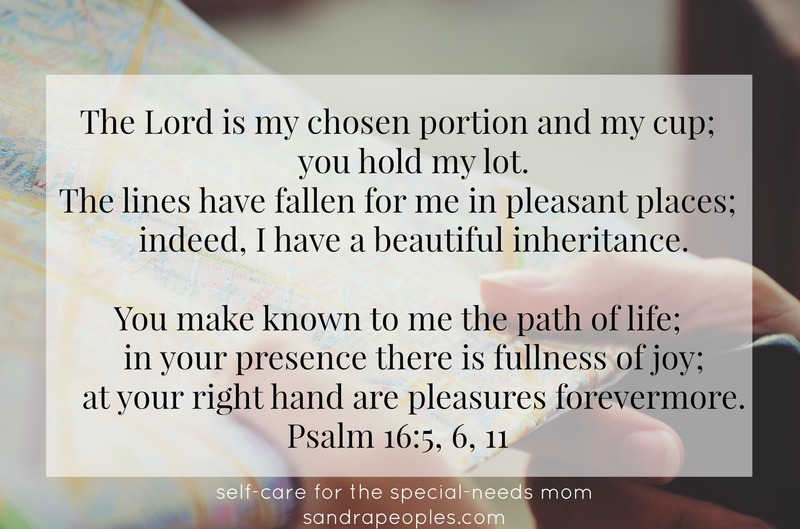 As special-needs moms, we find our life purpose within the boundaries and limitations God has set for us and we glorify Him best when we find joy there. In preparation for this series I read books on the topics I wanted to cover. This week I read chapters from What’s Best Next as I thought about my purpose and passions. The author does a great job taking the reader though a process of figuring how what our purpose in life is and how to live out that purpose through or goals and roles. As Christians, our life goal is set by our Creator. As the Westminster Catechism states: “Man’s chief end is to glorify God and enjoy Him forever.” This purpose is for every day of your life, no matter what season our situation you are in. It doesn’t even stop with your death. You glorify God by doing what He calls you to do: loving Him and loving others. What this looks like in your life will be different from how it looks in my life because although we have the same purpose, we have different gifts, skills, situations, backgrounds, families, churches, neighborhoods, and jobs. For you formed my inward parts; you knitted me together in my mother’s womb. I praise you, for I am fearfully and wonderfully made. Wonderful are your works; my soul knows it very well (Psalm 139:13-14). And he made from one man every nation of mankind to live on all the face of the earth, having determined allotted periods and the boundaries of their dwelling place, that they should seek God, and perhaps feel their way toward him and find him. Yet he is actually not far from each one of us (Acts 17:26-27). Worthy are you, our Lord and God, to receive glory and honor and power, for you created all things, and by your will they existed and were created (Revelation 4:11). But here’s why I think this process of purpose-finding and goal-setting is different for the special-needs mom than it is for most people—every dream and goal I had changed the day we got James’s autism diagnosis. No matter what I thought my calling was when I was 5, or 15, or 25—the calling that overshadows almost every other goal I had is being James’s mom. But this wasn’t a mistake. This didn’t surprise God. When He created me with a set of gifts and calling, He did so knowing I would be James’s mom. That means I can still achieve every purpose He has for me within the constraints of my daily life. Psalm 16:6 says the lines have fallen in pleasant places. Those lines set the boundaries of what I’m able to do and they are pleasant. They are for my good and my family’s good. So as you pray about your purpose and passions, remember God equipped you to fulfill His purposes for you. You live out your purpose by living the life He has called you to live.